Conference Facilities South Africa has a comprehensive list of conference venues and centres with conference facilities in the Northern & Eastern region of the Free State Province in South Africa. The Northern and Eastern regions in the Free State province of South Africa are bordered in the north by the Vaal River and in the east by the Drakensberg mountain range. This region in the Free State produces a major portion of South Africa’s maize crop. The Golden Gate Highlands National Park is situated in the Northern and Eastern Free State region. This park is renowned for its natural beauty, and takes its name from the brilliant shades of gold cast by the sun on the sandstone cliffs of the park. Bethlehem is situated just to the north of the Golden Gate in the Northern and Eastern region of the Free State province of South Africa. The name Bethlehem means "house of bread" which is appropriate as the town is situated in the heart of South Africa's wheat growing region which produces a big percentage of South Africa's maize and wheat. The Free State town of Deneysville owes its existence to the construction of the Vaal Dam which was completed in 1938. The Vaal Dam is the main source of water for the Witwatersrand region of Gauteng. Deneysville is a popular venue for water sports enthusiasts, housing four yacht clubs as well as boat building and boat repairs services. Established in 1849, the Free State town of Harrismith is situated on the border between the Free State and KwaZulu Natal provinces of South Africa. Harrismith gets its name from Sir Harry Smith who was a governor of what is now known as the Free State. Harrismith is known for the large flat topped mountain, the Platberg, which sits just behind the town. The town also features many reminders of the Anglo-Boer wars fought in the Northern and Eastern region of the Free State. To the south of the Northern and Eastern Free State region lies the small town of Hobhouse on the banks of the Leeu River. The town is named after Emily Hobhouse, the famous Anglo-Boer War concentration camp heroine. To the north of Hobhouse is the agricultural town of Ladybrand which was founded in 1867. Ladybrand sits at the base of the Platberg ridge and is an important administrative town in the wheat and sunflower belt of the Free State. The town lies just a few kilometers from the Caledon Bridge which forms the main border post between South Africa and Lesotho. 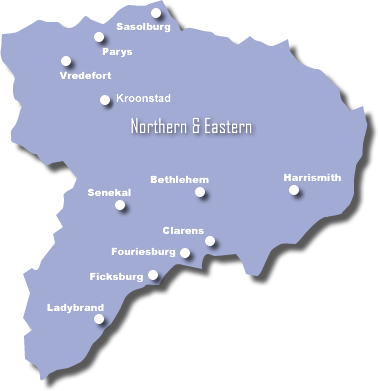 The Northern and Eastern Free State region town of Kroonstad is believed to be named after a horse, Kroon, which belonged to the prominent Boer leader Sarel Cilliers. Kroonstad is an important centre for the production of maize, wheat, meat, sunflowers, dairy products and wool. Some of the more important towns in the Northern and Eastern region of the Free State province of South Africa include Bethlehem, Clarens, Ficksburg, Fouriesburg, Harrismith, Ladybrand, Memel, Odendaalsrus, Parys, Sasolburg, Senekal, Swinburne and Vredefort.